I was surprised to see that I had the Monday crossword this week, as I couldn't recall any Monday-level puzzles of mine that were in the New York Times queue. In fact, when I first set eyes on the grid, I wasn't convinced the puzzle was mine! Luckily, looking at the solution jogged my aging little grey cells. I constructed this crossword in honor of my all-time favorite detective four years ago, when I was 14 and fresh out of middle school. Yes, I built this puzzle back in the days when my hair stuck out like crazy, Paolo Pasco was just a handful of years past the fetus stage, and I dreamt of having a girlfriend someday. Oh wait, that last reminiscence still applies--I guess some things don't change as you get older! Anyway, I remember being super stoked when Will informed me that he liked my theme. After removing a number of stinkers from the fill under Will's expert guidance (including URGER, INGLE, and ALC), I received an e-mail saying that the puzzle (my third) was accepted. Interestingly, though, Will felt so strongly about running the puzzle on an anniversary of some sort that he wanted to save it for 2020 (the hundredth anniversary of the first Poirot novel)! I remember being a bit disappointed that I'd have to wait for so long but excited that I'd created a time capsule in Will's pipeline. I mean, what graduate school girl wouldn't be impressed if I told her I'd built the puzzle nine years earlier? Looking back on the puzzle today, I'm not thrilled that I made the reveal the second theme entry, and I don't think I would have put quite as many partials and abbreviations in the fill. That said, nothing in this puzzle makes me cringe too much four years later, and I still love how the little grey cells are shaded in the center! As for my puzzle coming out in 2015 rather than 2020, I'm kind of glad Will lessened its solitary confinement sentence in the deepest recesses of his Monday folder. I hope you enjoy this easy blast from the past, because I'm quite sure none of the other puzzles I have in Will's pipeline will be Mondays. Mwahahaha! As a big fan of Poirot and his eccentricities, I enjoyed seeing the apt LITTLE GREY CELLS in the center of the puzzle. If you haven't read or seen any Poirot mysteries (shame on you), he often uses that phrase re: how he solve crimes. And I hadn't remembered that Christie describes Poirot's head as "egg-shaped," but indeed she does. 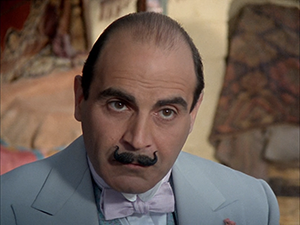 The actor David Suchet (pictured above) is just about perfect! It's like he wore an egg-shaped helmet in order to prepare for this role. Now that's method acting! I might have preferred something more specific about Poirot's moustache than just MOUSTACHE, like how it's a handlebar, or how he sleeps with a snood (a tres chic moustache hairnet). 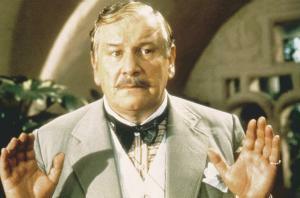 In that same vein, it would have been great to have something more specific to Poirot than just DETECTIVE. It makes for an anticlimatic end to the puzzle. Out of curiosity, I searched for other terms more specifically describing Poirot's oddities. "Pink-tipped nose," "upward-curled moustache," and how he utilizes "order and method" when employing his LITTLE GREY CELLS came up. I do like "upward-curled" better than just MOUSTACHE, but at 12 letters, it doesn't have a symmetrical partner. Having to adhere to crossword symmetry sometimes means you can't always get what you want. That north section is tricky, having to work around MOUSTACHE and HERCULE POIROT. I can understand needing something like A LOOP or SO I — better to have just one partial in a little region though — but I would have preferred not to see Mr. MOTO in the grid, as it made me wonder if this was going to be a crossword generally about DETECTIVEs. I think it's more elegant to restrict fill so it doesn't dilute the theme. It was good to learn that this is actually one of David's earlier puzzles, as I wouldn't expect to see gluey bits like ENS/CEE/DIR/ILS aggregated in one of his puzzles today. Neat to see how far he's progressed in such a short time. Average word length: 4.87, Scrabble score: 298, Scrabble average: 1.61. Puzzle has 10 fill-in-the-blank clues and 4 cross-reference clues.